Find out why the Jacobite Risings of 1715 and 1745 failed as you meet a Highlander held prisoner in Edinburgh Castle. Find out why the Jacobite Risings of 1715 and 1745 failed as you meet a Highlander held prisoner in the castle. 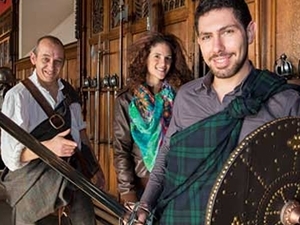 Hear tales of Bobbing John, Bonnie Prince Charlie and the battle tactics of a Highland army and learn the secrets of Scotland’s national dress. While we take every opportunity to ensure the details for Kilts and Captivity are accurate, we always advise that you contact the event organiser before setting out for the event to avoid disapointment.